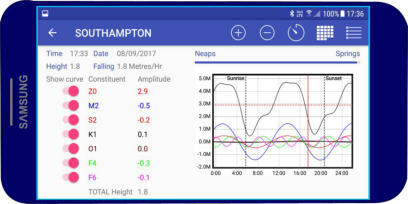 Tidal Height Predictions App Neptune Tides for the Android is an easy to use tidal height prediction software for 347 UK & 312 European ports. This software is full of features, displays the daily curve, instantaneous rate of rise or fall of the tide (in metres per hour), sun rise and set times, lunar phases, springs to neaps indicator, monthly tide times and heights. Advanced Functions allow you to display and play with the astronomical tide raising forces, brilliant for education and the understanding of complex tidal patterns, it becomes instantly obvious why some ports have stands, double highs or lows. This program contains many other useful features.